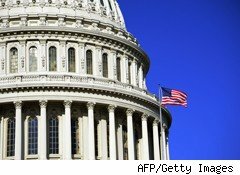 Nearly two years after the nation's banking system imploded -- sending several major financial institutions to their doom and threatening others with collapse -- the House of Representatives passed a financial regulatory reform bill intended to ensure that such a calamity never happens again. Democrats portrayed the bill as a much-needed measure designed to rein in Wall Street, protect consumers and prevent future financial crises. Announcing the bill's passage by a largely party-line vote of 237 to 192, Rep. Nancy Pelosi (D-Calif.) rapped the gavel to cheers from her Democratic colleagues and grumbles from Republicans who spent the afternoon assailing the legislation. "This bill is a massive intrusion of federal government into the lives of every American," declared Rep. Spencer Bachus (R-Ala.) "It will move us further toward a managed economy with the federal government making decisions that should be in the hands of individuals and businesses." The so-called Wall Street reform bill, the most sweeping overhaul of financial regulations in decades, would impose new restrictions on the nation's biggest banks and create a new consumer protection bureau for mortgages and credit cards. Meanwhile, Senate Democrats said they had no choice but to postpone their own action on the bill until after the July 4 recess -- despite offering Republicans major inducements to vote for the legislation. The delay means that the Democratic majority could not make good on its goal to hand the bill to President Barack Obama before the holiday. On the other hand, Senate Democrats have bought themselves some breathing room to organize the votes needed to pass the bill. If Democrats can muster the votes needed to break the GOP filibuster, they will be nearly assured of sending a bill to Obama's desk that would represent a key political victory for the President, who has pledged to crack down on Wall Street's excesses. Senate passage was thrown into doubt with the passing of Sen. Robert Byrd (D-W.Va.) and the announcement by Sen. Scott Brown (R-Mass.) that he could no longer support the bill thanks to the last-minute inclusion of a $19 billion tax on big banks and hedge funds. In an effort to appease Brown and other Republicans, congressional Democrats reconvened the financial reform conference committee -- a highly unusual move -- and scrapped the bank tax. Instead, they said they'd use $11 billion in savings from the Troubled Asset Relief Program and increase bank premiums to fund the Federal Deposit Insurance Corporation by $5.7 billion in order to pay for the bill. Democrats were lambasted for that move by Republicans who accused them of sham accounting -- Sen. Judd Gregg (R-NH) called it a "fraud on the American people" -- and the move didn't even bring Brown back into the fold, though Sen. Susan Collins (R-Maine) said she would now support the bill. Brown said he would review it. "I appreciate the conference committee revisiting the Wall Street reform bill and removing the $19 billion bank tax. Over the July recess, I will continue to review this important bill," Brown said in a statement. "I remain committed to putting in place safeguards to prevent another financial meltdown, ensure that consumers are protected and that this bill is paid for without new taxes." On Wednesday, Sen. Maria Cantwell (D-Wash.), who had opposed the bill as not going far enough, hinted that she might vote to defeat a GOP filibuster, even if she might ultimately oppose the bill in a final vote. Sen. Russ Feingold (D-Wis.) has said flatly he will oppose the bill for the same reason. But Sen. Olympia Snowe (R-Maine) has also hinted she might support the bill. Democrats are also counting on Senator Byrd's West Virgina replacement to back the legislation.